Apo Island is a tiny island located in Dauin between Negros Oriental and Siquijor. In this blog post we will tell you how to get to Apo Island from Dumaguete in our Apo Island travel guide. Apo Island is a paradise to enjoy! There are a few things to do in Apo Island. Most of the people go for snorkeling or diving. You can go on a day tour or overnight. You can’t miss Apo Island if you are traveling around Siquijor, Dumaguete or Cebu. Read here how to get to Dumaguete City! Read here where to stay in Dumaguete! There are jeepneys going to Malapatay leaving from the market. It takes 45 minutes and it costs 25 PHP. Also Ceres Liner is going to Malapatay and it costs 50 PHP air condition bus and 25 PHP not air condition bus. Tell the driver to stop at Malapatay Market. You have to cross the market until you reach the beach where you will sea the boats going to Apo Island. There are a few options private boat 2000 PHP good for 4 people, 3000 PHP good for 8 people and 3500 PHP for 10 people. You have to agree when to come back and it’s including the return if you go for a day tour. The travel time is around 40 minutes to one hour depending of the sea. There are public boats charging 300 PHP per person and 20 PHP for residents in Apo Island. But there is no proper schedule for local boats going to APo Island. Last boat is leaving to Apo Island around 4 pm so make sure you get on time. First boat is leaving around 8 am! Weather-wise, the best time to visit Apo Island is from February to March and from May to early June as this is the driest and coolest months of the year. Still, year-round temperatures really don’t vary much in Apo Island. Rain does fall quite often during the wet season, though, especially around October, so you might want to consider visiting earlier in the year. Click here to know more about the weather in Apo Island! There are only living around 1000 people in the island. There is no continuous electricity in Apo Island. And it’s usually you will have electricity from sunset around 6 pm until midnight. There are a few hotels with their own generators that will give you a few more hours. There are no ATM’s so make sure that you are bringing cash if you stay overnight. The boats are going to Apo Island from 8 am to 4 pm. If you share a boat you have to agree the schedule that you will be back. The latest boat leaving Apo Island is 4 pm. Read general information about prices and entrance fees in Apo Island. The admission fee is 100 PHP. A guide for snorkeling will cost around 300 PHP good enough for 4 people. You can also rent snorkeling gear for 100 PHP and life jacket for 200 PHP. The fees for diving are 200 PHP per person. Diving costs around 1500 PHP. There are day tours from Dumaguete to Apo Island that costs 1000-1200 PHP per person. 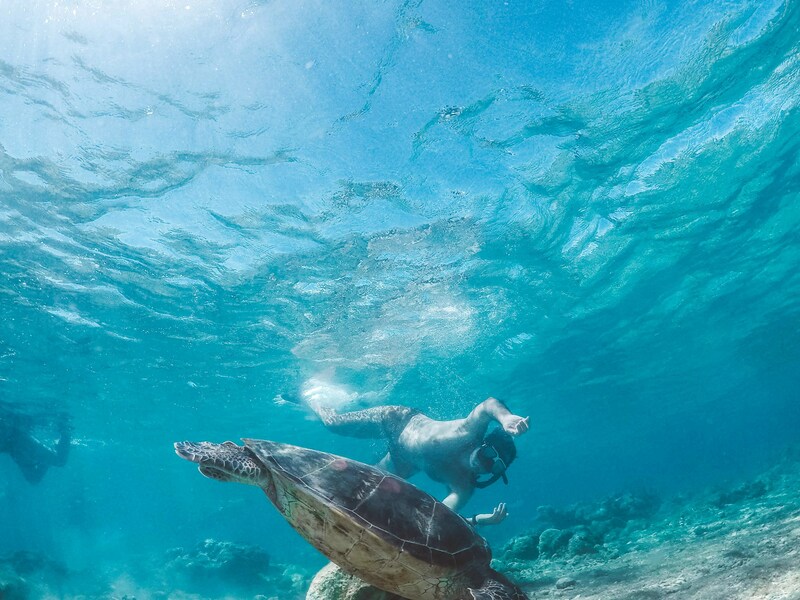 The main activity is diving or snorkeling with the turtles and it’s something that we can recommend 100 %. We were snorkeling for a few hours and we saw plenty of turtles. You can stay overnight in the island if you wish. Click here if you want to get your discount booking activities in the Cebu, the Philippines with Klook! If you are going to Apo Island there are day tours from Dumaguete 1000-1200 PHP that they will include entrance fees, renting snorkeling gear and transportation. It’s almost the same price that if you decide to do on your own. You don’t have to be an expert for snorkeling in Apo Island. 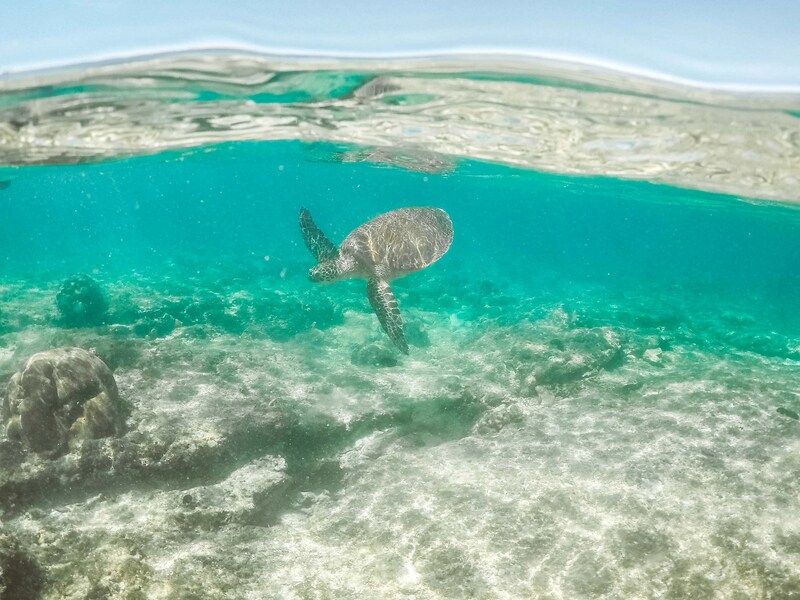 You will see turtles everywhere and even coral life very close to the seashore. You will have to rent your snorkeling gear or bring your own. In the tourist office where you pay the fees they will take care of your belongings. If snorkeling is amazing diving will be awesome too. There are companies offering diving in Apo Island: Mario’s Diving Center, Beach Resort and Acqua Dive. Climb to the lighthouse there are 400 stairs to go to the lighthouse. The best is going early morning to enjoy the views from the top. A cold beer or a shake while enjoying the sunset is a perfect plan wherever you go! So if you are staying overnight in Apo Island will be one of the things to do in Apo Island. Filipino people are so friendly and especially in the islands are happy to meet foreigners. You can walk around the island in a few minutes since it’s not really big. There phone signal in Apo Island is weak. But you can still can get data. In our case Globe was working properly to catch up with Instagram Stories and check internet connection. Read here if you want to know the best Filipino Sim for tourist. As we mentioned above there is no continuos electricity. Just bring your power bank to make sure you can charge your phone and devices. We always bring our own snorkeling gear so you will save 100 PHP. Most of the places in the Philippines are great for snorkeling so it will be great having your own all the time. Take pictures everywhere with your camera and underwater camera is amazing the underwater life in Apo Island. Of course if you have a drone fly it around! Very Important: Please make sure you respect the turtles and the corals and don’t touch them. Also be careful with the trash and allow next visitors to enjoy paradise! Apo Island is really small and there aren’t many places to stay. Prices for a room can go from 1000-2000 PHP. You can go cheaper or higher from these rates depending the comfort that you wish! If you want to stay with Airbnb in Apo Island. Click here to get $30 USD off your first booking with AirBnB! You can book a place in Apo Island before you travels! Click here to get the best deals with Booking and Agoda.